A list of the surgical team present during heart surgery is described below. A cardiovascular surgeon, who leads the surgical team and performs the key parts of the surgery. 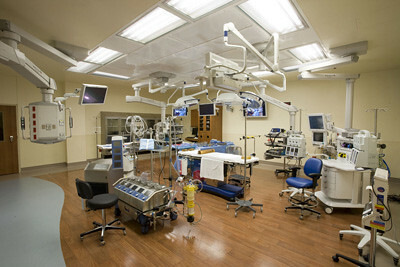 Assisting surgeons, who follow the direction of the cardiovascular surgeon. A cardiovascular anaesthesiologist, who gives the medicines that make you sleep during the surgery (called anaesthesia). The anaesthesiologist makes sure that you get the right amount of medicines throughout the surgery and monitors the ventilator, a machine which breathes for you during surgery. A perfusion technologist, who operates the heart-lung machine. Cardiovascular nurses, who are specially trained to assist in heart surgery. The exact type of anaesthetic you are given depends on the procedure you are having. For most operations, anaesthesia is started by injecting a drug into your vein. Within seconds you will fall asleep and won’t wake up again until after your operation is completed. This is known as the ‘induction’ of anaesthesia. It is also possible to bring about anaesthesia with anaesthetic gases, breathed through a face mask. Your anaesthetist will decide what is best for you and will stay with you during the operation. To keep you asleep, you will be given a mixture of oxygen and anaesthetic gases through a flexible tube put into your windpipe. This part of anaesthesia is known as ‘maintenance’. 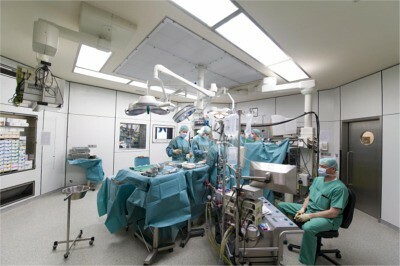 During the operation, you will be connected to machines that monitor the activity of your heart and other bodily organs. Your anaesthetist will keep a close check on your heart rate, blood pressure, and the amount of oxygen in your bloodstream. The heart-lung machine is also called a cardiopulmonary bypass machine. It takes control of blood flow around the body during the operation by replacing the heart’s pumping action and by adding oxygen to the blood. This helps the heart to remain stationary for the operation, which is necessary when the heart has to be opened (open heart surgery). Because the heart-lung machine takes over the work of the heart, a surgeon can more easily operate as the heart is not moving or full of blood. How does the heart-lung machine work? 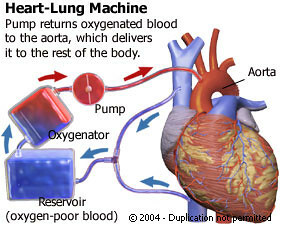 The heart-lung machine carries blood from the right side of the heart (the right atrium) to a reservoir within the machine called an oxygenator. Inside the oxygenator, oxygen is bubbled through the blood allowing it to enter into red blood cells. This causes the blood to turn from dark (oxygen-poor) to bright red (oxygen-rich). A filter then removes the air bubbles from the oxygen-rich blood, and the blood travels back to the body’s main blood vessel, called the aorta. The aorta supplies the newly oxygenated blood to rest of the body in a continuous process of blood circulation. Specially trained technicians called perfusion technologists (blood flow specialists) make sure that the heart-lung machine does its job properly during the surgery. The heart-lung bypass machine provides a very safe and effective service which can take over the work of the heart and lungs for hours. However, your surgeon will try to limit the time that you spend on the machine to ensure that your body returns to is normal physiological function as soon as possible. This is also a heart-lung machine but in a miniature form. It guarantees a higher percentage of red cells (especially for patients of small statue and weight) and is equipped with biocompatible surfaces both of which can help to protect the function of your kidneys, especially for high risk operations. Mini cardiopulmonary bypass is associated with reduced bleeding following the operation, and possibly, a lower transfusion rate and lower incidence of peripheral thromboembolic events. Blood is cooled as it passes through the heart-lung machine. In turn, the cooled blood lowers total body temperature. It is usually necessary to inject a special potassium solution (called cardioplegia) into the heart which speeds up the process of stopping the heart from beating (moving) therefore enabling the surgeon to start performing the operation. 2011 update to the Society of Thoracic Surgeons and the Society of Cardiovascular Anesthesiologists blood conservation clinical practice guidelines.Society of Thoracic Surgeons Blood Conservation Guideline Task Force,Ferraris VA, Brown JR, Despotis GJ, Hammon JW, Reece TB, Saha SP, Song HK, Clough ER; Society of Cardiovascular Anesthesiologists Special Task Force on Blood Transfusion, Shore-Lesserson LJ, Goodnough LT, Mazer CD, Shander A, Stafford-Smith M, Waters J; International Consortium for Evidence Based Perfusion, Baker RA, Dickinson TA, FitzGerald DJ, Likosky DS, Shann KG. Ann Thorac Surg. 2011 Mar;91(3):944-82. Multimedia Manual of Cardiothoracic Surgery. Cardiopulmonary bypass collection.